Sagittarius August 2015 Horoscope forecasts that career issues will overshadow family and psychological issues this month. By end of the month majority of the planets will be in the Eastern sector of your birth chart. You will have to take your own decisions and direct the path of your life. You need not depend on the grace of other people, Sagittarius. You can be rigid and deal with tough situations by yourself. The Sagittarius 2015 August monthly predictions foretell that you will reach the zenith of success in your profession this month. It will be all work and no play for the Archers. You enjoy your career success and forget about other things for the time being. There will be financial rewards and change of status. You may shift to another place for professional reasons. Family life is likely to be neglected. 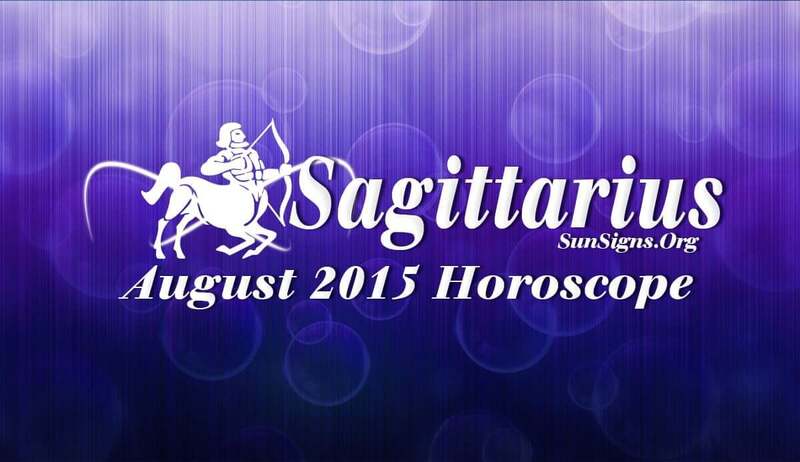 Monetary situation will be powerful in August 2015 for the Sagittarius zodiac sign. But you are dependent on others to achieve your financial objectives. Money flow will not require much effort. You are more interested in the popularity associated with riches than the money itself. Single Sagittarians will be presented with plenty of opportunities to find romantic associates. You will be looking for love at the work place and in socially influential circles. You should take a decision about the future of your relationship before the month end. Family life will be disrupted due to stress at the work place. You will not be able to give time to your children, spouse or parents. There are less chances for pregnancy this month. The August 2015 Sagittarius horoscope predicts that health requires special attention if you want to enjoy the fruits of your hard work. Take it easy after 22nd August. You can try these Bach flower remedies or music therapy for some relaxation from stress.